Beautiful place and high kitchen level! Dinner taken into wine club cellar of Zlaty Dukat hotel! Beautiful place, well reurbished and arranged! Highly professional waiters, highly fine and cooked dishes. Very good! 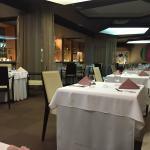 This restaurant is inside the Zlaty Dukat hotel which kind of makes it less desirable at first glance as you don`t expect the best for lunch and dinner in a hotel dedicated restaurant but this is not the case here. Now on the inside there is a growing discrepancy between the excellent display of unique antic pieces, some very high end decorations and the lack of care on table arrangements - the tables simply look like the old 80`s white cotton cover average quality restaurant - would simply go sleek and modern to upgrade and somehow unify the feeling you get when entering. Service would need a bit of attention too and a better marketing would not hurt either. It almost seems that even if could be a gem the owner somehow is just ok with the as is status. We have stayed overnight in hotel Zlaty dukat, where is restaurant Iris located. Food was very good to delicious, but...! The decoration on the table was very very cheap looking and unapealing! The tables were only half way made, missing cutlery, glasses, napkins... These we did not get until I have asked for them after our starter was on the table. They had only 1 waiter who took care of 2 large group, and the boy had lots of work. Highlight of this restaurant is its bathroom, believe it or not. The lightning was horrible, neon lamps is something you really don't wan't to see in 4* hotel restaurant. But as I have said, food was very very good, so I hope they learn some class there soon! Been to Iris Restaurant? Share your experiences!